CHICAGO, Dec. 5, 2017 /PRNewswire/ — Borden® Cheese continues to address consumer needs and incorporate feedback in the expansion of its iconic brand with the launch of new Thick Cut Shreds. Coming to dairy aisles this fall, the new Thick Cut Shreds are crafted with high-quality, wholesome ingredients consumers crave, and offer a delicious and nutritious option to families across the country. Despite being the largest segment within the cheese category, the shreds segment typically has lacked innovation and product advancement. 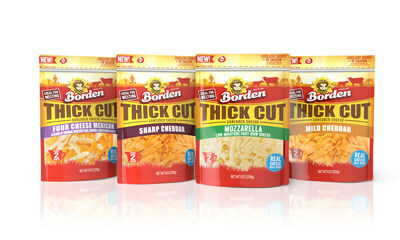 Borden® Cheese is shaking up the relatively unchanged segment with new shreds featuring a thicker cut for a smoother melt. Available in Mild Cheddar, Sharp Cheddar, Mozzarella and Mexican, Thick Cut Shreds provide an excellent source of calcium and are perfect for blanketing casseroles, skillets and cold-weather comfort foods with creamy, delicious flavor. This innovation offers smooth-melting shreds packed with 20 percent of the daily recommended calcium per serving, along with six to seven grams of protein at only 110 calories per serving. With each individual shred being five times as large and almost two times the weight of a regular cut shred, Borden® Cheese Thick Cut Shreds deliver the look of home-shred cheese and a superior melting experience for family favorite recipes. Known for the iconic Elsie the Cow, the popular heritage brand continues to focus on product innovation and staying relevant within the cluttered market. With the new packaging graphics rollout earlier this year, the recent introduction of Snack Bars and now Thick Cut Shreds and a strong pipeline of new products launching in 2018, Borden® Cheese continues its dedicated efforts toward reinvention of the century-old brand name, including new TV advertisements and a strong digital and social presence.